Skinheads go beyond the societal stereotype of hate mongers, bigots, and Neo-Nazis. The community of skins also includes traditional skins (those that adhere to the original philosophy of the British movement in 1969), Skinheads Against Racial prejudice (SHARPS), and gay skins, female skins and Neo-Nazi or Racist/Nationalist skins. 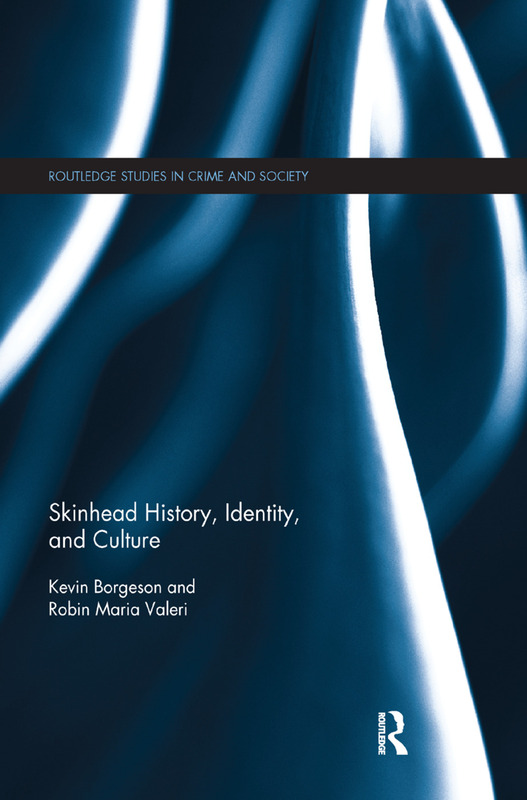 Skinhead History, Identity, and Culture covers the history, identity, and culture of the skinhead movement in Europe and America, looking at the total culture of the skins through a cross-sectional analysis of skinheads in various countries. Authors Borgeson and Valeri provide original research data to cast new light into the skinhead community. Some of the data is ethnographic, drawing on face-to-face interviews with skins of all kinds, while other data is compiled from the Internet and social media about various skinhead groups within the United States, Europe, and Australia. The book covers the history of the subculture; explores the unique cultures of female, gay, and Neo-Nazi skins; and explores manifestations of the culture as represented on the Internet and in music. The work discusses how skinheads derive their values and morals and how they fit into the larger social structure. Chapter Seven: Conclusion: Who is a True Skinhead? Kevin Borgeson, Ph.D., is Associate Professor of Criminal Justice at Salem State University. He has published several articles on female skinheads, gay skinheads, skinheads and the Internet, and hate on the Internet. The data he used for his research was based on two years of qualitative interviewing and ethnographic data on skinhead culture. He is the co-editor with Robin Valeri on Terrorism in America and co-editor with Krtisten Kuenhnle of the book Serial Offenders: In Theory and Practice. Borgeson has appeared on Fox News, PB,S and NPR as an expert on the topic of hate groups and hate crimes. Robin Maria Valeri, Ph.D., is Professor of Psychology at. St. Bonaventure University. Valeri earned a B.A. from Cornell University and an M.A. and Ph.D. from Syracuse University. She has published on a variety of topics including hate groups, skinheads, terrorism, Internet and social media, pets and laughter, and cigarette advertisements. Valeri’s work has appeared in the American Behavioral Scientist, Journal of Applied Social Psychology, Journal of Men’s Studies, and the Michigan Sociological Review. Valeri is co-editor of the book Terrorism in America and co-author of "Sticks and Stones: When the words of hatred become weapons" in Global Perspectives on Youth Gang Behavior, Violence, and Weapons, as well as co-author of Masculine Identities within the Skinhead Movement in Advances in Sociology Research (2016). Valeri has appeared on Time Warner Cable News Buffalo as an expert on terrorism.